This story started around March 2011 with three guys sat in the bar reminiscing about the sailing club and “the good old days” when it suddenly dawned upon them; why not write about those good old days, in fact lets go back to before C.V.L.S.C. existed and chart its history from that day to this. Those three guys were Peter Cheek who, now in his 85th year, was a founder member of the club; David Macklin, now in his eighties and also a founder member of the club and myself, Brian Brooks, not quite as old as the other two but a long time member of the club with a fairly good memory that goes back quite a way. Without too much delay we put certain plans in place that would hopefully chart the history of the C.V.L.S.C. Whilst writing about the very early days, David Macklin spent many hours sifting through available early minutes, some of his own, and some of those fortunately saved and given to him by Frank Webb, (one of the initial founders and committee members) a few years ago. Even with all this research, together with our own and other long standing member’s memories, we still seemed to find ourselves with some uncertainties and unfilled gaps, both for then and through the middle years, as sadly most of the Club’s official records have been lost in the annals of time. It was therefore very tempting at this stage to drop the whole idea due to the fear of making small inaccuracies or possibly omitting something which should have been included. History is nothing without accuracy, and the Club’s history involves many stages and events involving a large number of member’s contributions towards its development over the years. However it did seem a shame to waste so much of the work that we had already written, and let all the information diligently accumulated by us go unrecorded before it was lost for ever, so we decided to proceed with our project. 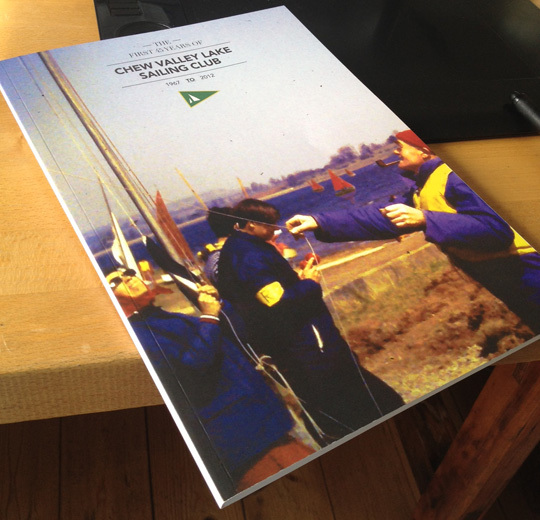 Rather though than giving it the pedantic and authoritative title of “The History of Chew Valley Lake Sailing Club” we could just simply call it “The First 45 Year of Chew Valley Lake Sailing Club”, which would be our own story, written as accurately as possible using information available together with our combined knowledge and experiences. We would aim to mention as many significant members as we could remember, or had information about, and hope that any omission of either events or members, who contributed to the Club’s development, would be forgiven. Having settled on this approach to the book we still met with queries from members who were helping us with information and who asked why we were writing it now with the title of the first 45 years? Seeing that the first 50 year Anniversary would be approaching why not wait and have it ready for 50 years? Well the answer to that one is in the second Paragraph. The ages of the two principle contributor as well as other members from whom we needed information about the early years, and whose own ages were also equal to or older than 85, meant that we had to strike whilst the iron was hot and we could still remember dates, times and incidents. Another five year wait might possibly have put paid to the whole idea. And so very briefly, what does the book do and what does it tell us? The book makes the point right at the beginning that it’s not about personalities; names have been left out for fear of upsetting those members that feel they deserve a mention. Names and honours have only been included where it was felt necessary to complete the specific section or where a significant part was played by certain members in the development of our club. The book concentrates on a club owned and run by its members – we have all in one way or another played our part in the development of this club and put it where it is today; a premier sailing club in Britain. It charts the clubs progress from the point in time when ideas were being put forward to try and persuade Bristol Water to permit sailing on the lake through to the club as we see it today. Should you decide to purchase a copy of the book please bear in mind that not one of the three authors is considered to be an accomplished writer. Without the help of Nigel Carson and his wife Shelley, Ian Collis-Smith (Fanatic Designs) and many members too numerous to name here, this book may never have been finished and most of you would never know how the past has shaped this club of today. However the book has been completed and it has been left open at the end to allow its update for a 50th Anniversary edition to be produced if so desired – but not by us three.